It was my mother-in-law’s birthday and I planned to bake my Tofu Cheesecake with Purple Yams. However, as you might have noticed, I’m totally into everything with pumpkin at the moment. 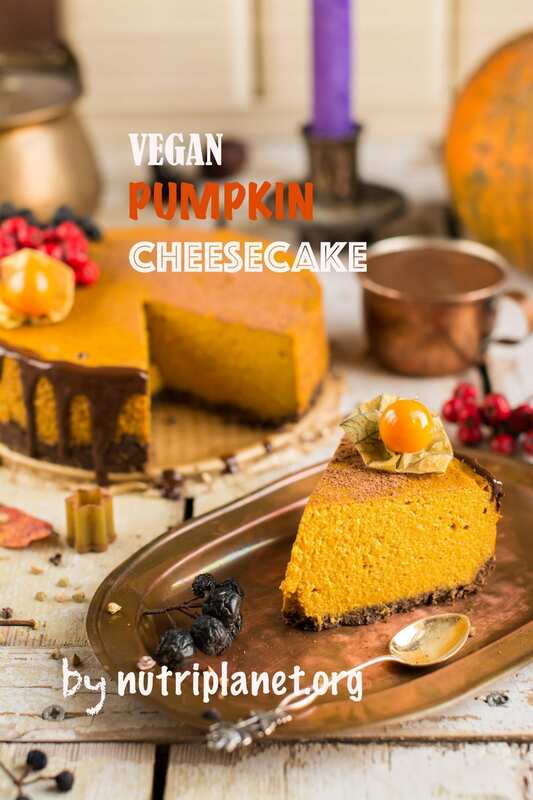 So, I created a totally new recipe – vegan pumpkin cheesecake with silken tofu. NB! Watch tutorial video further down! As many times before, I was afraid I’d need to give the recipe at least several tries before a satisfactory outcome. Nevertheless, my concerns were unfounded. Instead, when I took the first slice of my vegan pumpkin cheesecake, I was pleasantly surprised as the silky-smooth texture was just perfect. 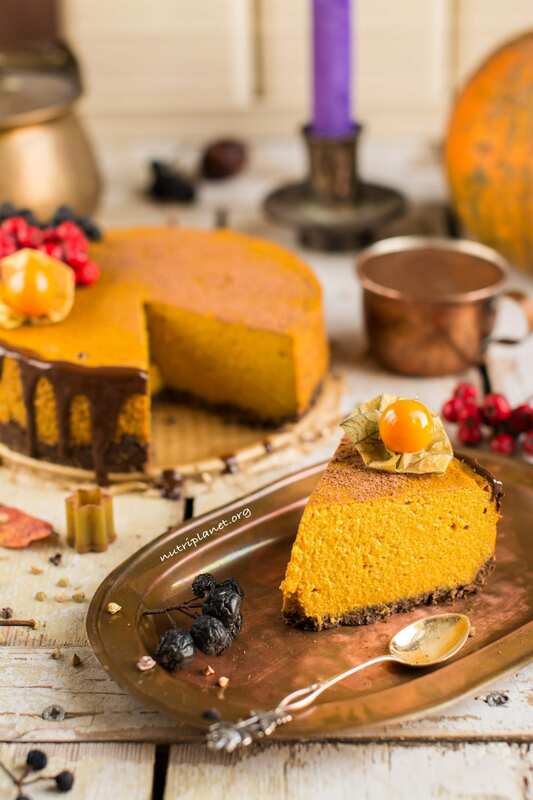 Now, I’d strongly recommend pairing this vegan pumpkin cheesecake with my healthy chocolate sauce, as it really is a match made in heaven. As you already might know, I’m not into overly sweet things. Therefore, also my vegan pumpkin cheesecake is only mildly sweet. So, feel free to add more sweetener, if you need to. Actually, I’d add a bit more myself, if I had the cheesecake plain, i.e. without the chocolate sauce. However, with the sauce the combination of tastes is ideal. Finally, I have to be honest and tell you that my vegan pumpkin cheesecake is not something you could mindlessly munch on. It’s still a cheesecake! The reason is that it is not a low-fat food. In fact, half of its calories come from fat. However, pair it with low-fat dinner with no added oils or other high-fat foods (tofu, nuts, seeds, avocados or olives) and your total numbers would be balanced. See tips on my vegan pumpkin cheesecake below for leaner version. 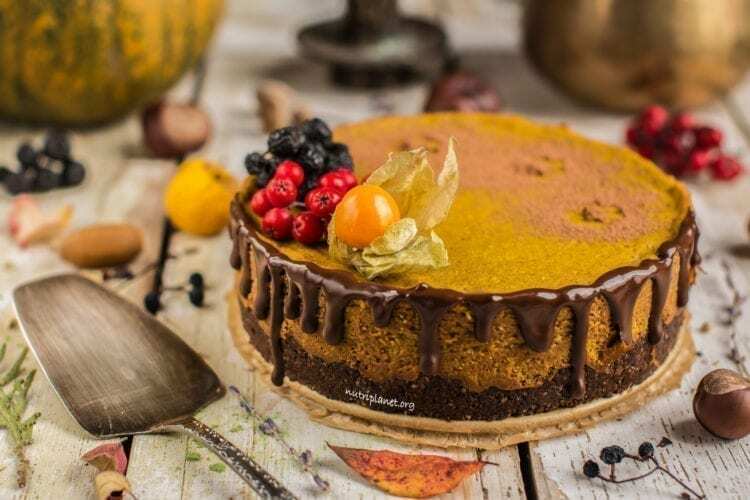 To sum it all up, my vegan pumpkin cheesecake recipe is plant-based, oil-free, refined sugar free, gluten-free and suitable on vegan Candida diet (except on cleanse). First, process walnuts with a pinch of salt until fine crumbs. Then, add the remaining crust ingredients and process again until the batter sticks together when squeezed between fingers. Next, press the crust batter into 6” (15 cm) or 6.3” (16 cm) spring form cake tin lined with parchment paper and bake at 190°C (375°F) for 10 minutes. Remove from oven and let cool. To make the filling, combine all ingredients in a bowl and process with immersion blender until smooth. You may also use regular blender. Now, pour filling onto crust, smooth it out with spatula or spoon and bake at 175°C (350°F) for 50 minutes. Let cool completely before serving. Nutritional info (⅛ of the cake): 125 kcal, 7.5g carbohydrates (50.5% of kcal), 7.06g fats (50.6% of kcal), 5.99g protein (19.1% of kcal), 3.98g fibre, 6.9 GL points. The cake is absolutely amazing with my Healthy Chocolate Sauce. Check my Pumpkin Muffins Recipe for directions on how to make homemade pumpkin puree. If you don’t have yakon powder, add 1 more teaspoon of xylitol. Or substitute with lucuma powder or mesquite powder. 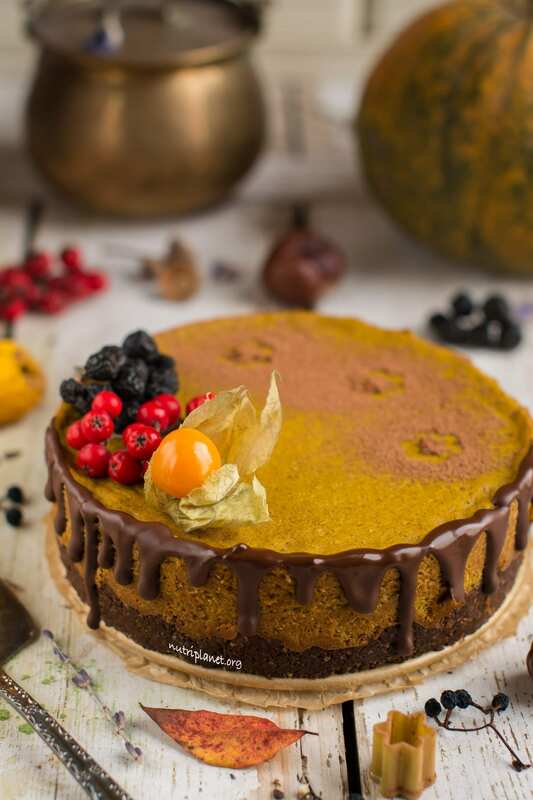 Now, the sweetness of this cake greatly depends on your pumpkin. For example, should you use a very mild/light variety, you might need to add more xylitol or other sweetener. I usually go for butternut squash, which is the sweetest and creamiest. Should your turmeric have very strong flavour, add only half a teaspoon. It’s important that you measure level tablespoons of flour and psyllium husks. Otherwise the cake will be too firm. Finally, ditch peanut butter and/or make the cheesecake crustless to have a leaner version. 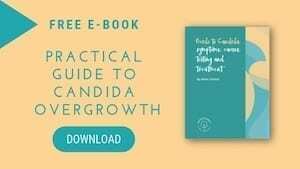 Disclaimer: the recipe and tips contain links to products that I recommend and that meet my requirements. Congrats on getting it perfect the first time! That’s hard to do! It looks delicious! I plan on making your beautiful pie for thanksgiving. Any tips if I don’t have a spring form pan that small? The smallest I have is 21.5 cm. Regardless I can’t wait to enjoy your pie! I’m so glad that you’re going to try the recipe! First option — leave all quantities as they are. You’d have a thinner cake with thinner crust. I’d also diminish the baking time by 5-10 minutes. Second option — as the diameter of your tin is about 40% longer, multiply all ingredients by 1.5, i.e. instead of 400g tofu, take 600g etc. Third option — double the recipe and bake about 5-10 minutes longer. Do let me know how it turned out! I chose the second option. It was SO delicious, everyone in the family loved it even those without any dietary restrictions. I’m thankful I found your lovely recipes and guidance! Happy thanksgiving!! I cannot wait to make this! I LOVE all things pumpkin too:-) Question: In your nutrition information doe the GL points = Glycemic Load? Definitely let me know how you like it! I made it for NYE and my friends loved it too 🙂 Yes, GL is glycemic load! This cheese cake looks so good! So far, I have not attempted making a cheese cake, but I think this recipe is a good one to start with. Thanks so much! I’m so glad to hear that! I hope you’ll like it!